Just getting going with NO calibration. Improvements will be made as realtime radar comes in. Emigrant Dam was selected to imrpove simple Modpul reservoir operations. The system plumbing was important here so snowmelt and calibrations can wait. Update Oct 2016: With 3-4 inchs of rain/snow in Oct the soil Curve Numbers and interception factors have been updated. I'm now thinking how an irrigation district could have its whole system operated top to bottom... 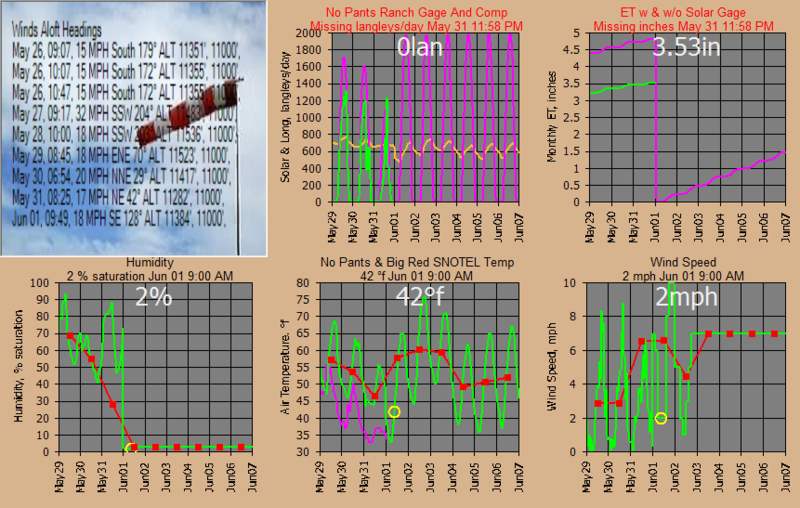 ET crop use, water orders, rainfall, water order cuts,.. the whole enchillada. The plumbing is now ready so let's get going FOR FREE. The plumbing... 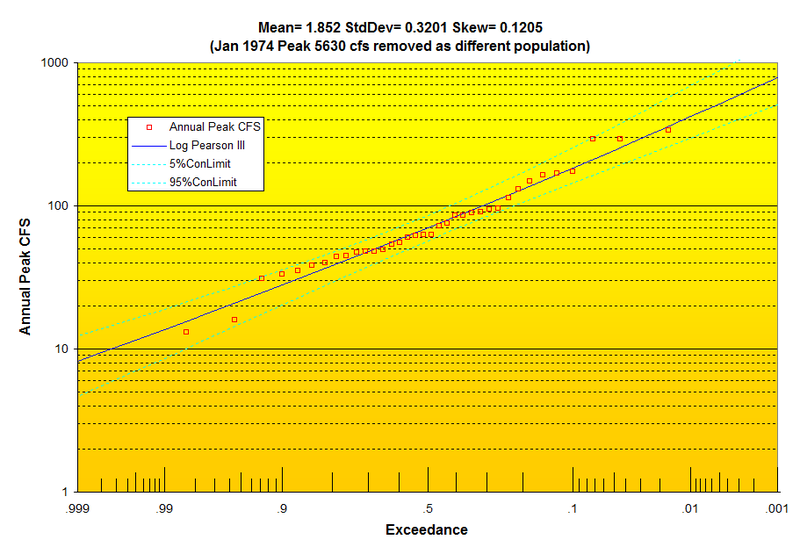 Note USGS Bear Cr gage just below Talent Canal diversion as study end point. This area turned out to be a very interesting scheduling and routing example so with my free GetRealtime updated even Grand Coulee is on the menu now without shelling a Hec-RESSIM reservoir model and thats a load off! The 168 sqmi basin above the USGS streamgage 14354200 BEAR CREEK BLW ASHLAND CREEK AT ASHLAND, OR (gage datum 1,686.64 ft) was subdivided into 13 subbasins using my free GetMapArea. 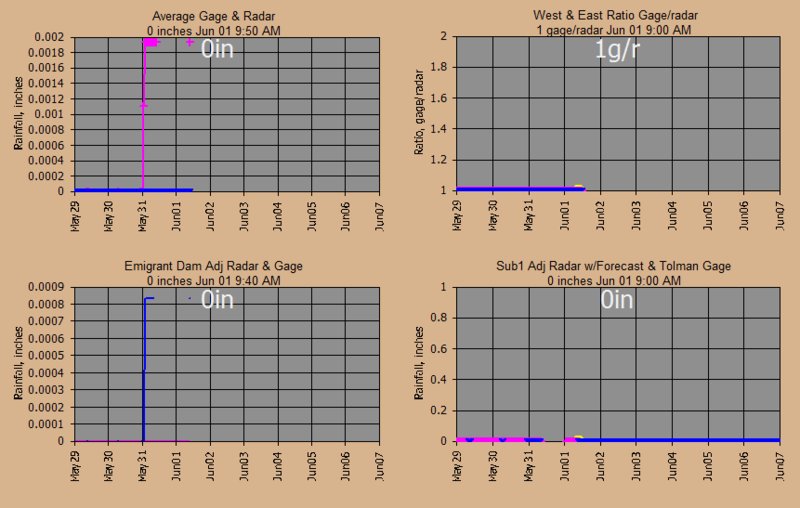 The subbasins are shown on my free GetNexrad display below. Snowmelt elevation bands will probably be needed but for now I want to see how far I can get with out more subdividing. Update: Now that Google Earth Pro is free I have found using it for boundary lat/longs and elevation band areas to be VERY helpful. The saved KML polygon lat/longs can be converted to boundaries using my GoogleKML2Text.exe. 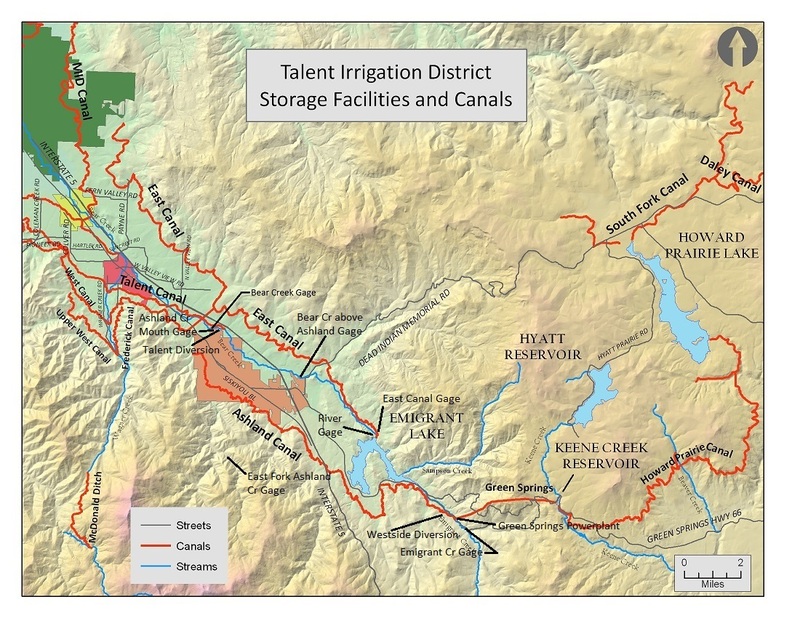 Emigrant Dam has a 39,000 acre-foot reservoir operated by the Talent Irrigation District. 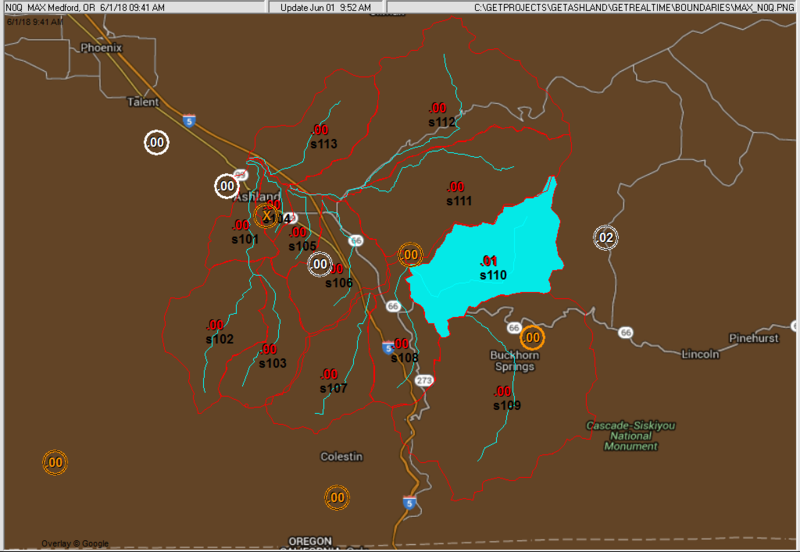 The USBR Hydromet data system provides near real-time releases and forebay elevation. My runoff model uses the latest release and operates the reservoir with model forecast of runoff. I doubt the spillway has ever been used from the looks of the brave souls building right on the river below the dam but you just never know about rain on snow. Releases are limited to the 670 cfs river channel capacity and exclusive flood space target elevation is 2241 ft for joint use conservation. Flood stages at Ashland will most very likely be local runoff and runoff below the dam... unless you patiently watch here... for decades... or tomorrow. The 8.14 sqmi basin for USGS streamgage 14353500 EAST FORK ASHLAND CREEK NEAR ASHLAND, OR (gage datum 2,903.70 ft) has not been subdivided and should prove helpfull in calibrating forested subbasins... which means very little runoff from the looks of the annual peaks. I have also added a snowpack to Subs 2 and 3 on upper Ashland Creek on June 1 to match the flows at the gage, but the swc is a guess and the snowpack lastet only 3 days anyway so I added 1.75 inches to soil moisture on Jun 9 to match the East Fork Ashland Creek gage flow. The channel routings were cascading Modified Puls ratings using my free ModPulXsec with x-section data measured with Google Earth about midway in each reach. 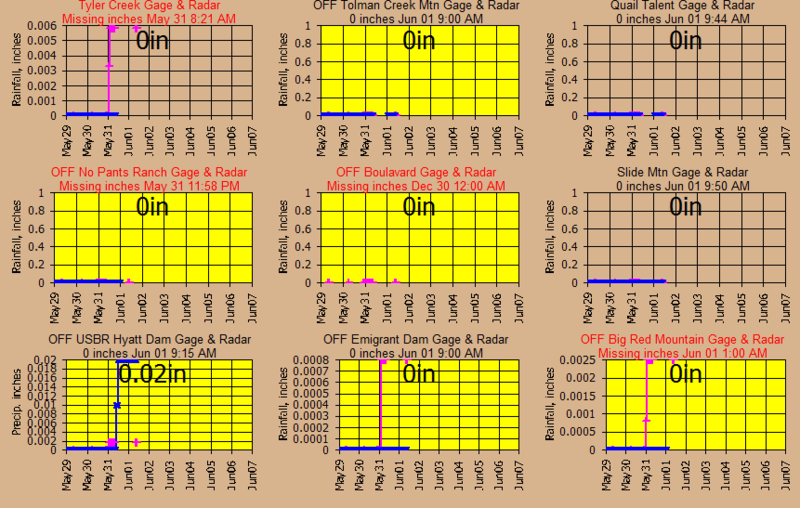 The bank full elevation is the flood 'Action Stage' at my ratings and the USGS gage rating. 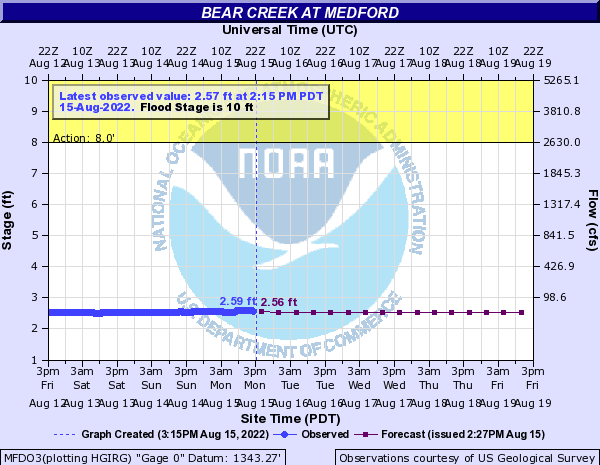 The NWS operates a forecast flood site at the next downstream gage on Bear Creek above Medford, OR. Normally I run some history to calibrate the soils, but in this case I'm more interested in operating a Modpul rating for Emigrant Dam so I'll get the soils caught up eventually. 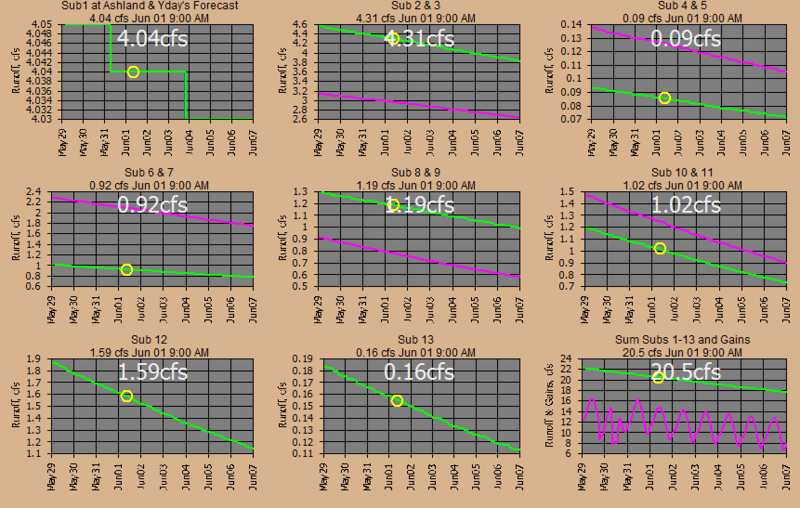 You could shell a Hec ResSim model but a quick Modpul should be sufficient here once I get the fleas out of my scheduled hourly RELEASE for a MODPUL and ADD command for release, inflow, and diversions. 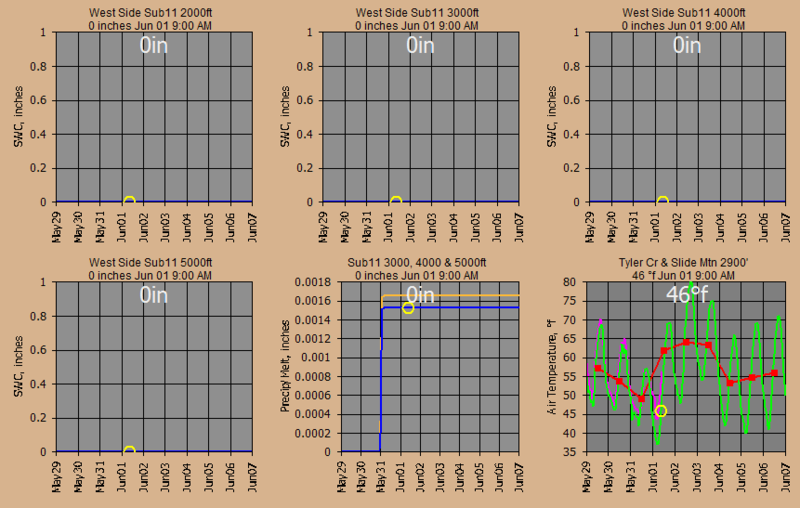 All flows, snowmelt, and runoffs are 5-minute values to match radar rainfall needed on small basins. Let's see how we do in real-time (all times are my Pacific Time). This web page is automatically updated hourly as my free GetRealime runs in unattended batch mode on a low powered Windows 10 laptop... when rain/snow is in the area. Probably not so much here where it hardly rains during the irrigation season, but an irrigation district could use the areas of rainfall above to know how to cut water orders and areas of runoff affecting water quality. And in rough years what areas have been the driest for season startup. Now at this point as an example, any irrigation district could replace the need for the USBR data used here by replacing the schedules and history in the database themselves. Jun 1, 2016: Using Napa Valley, California soil setups and unit graph. Interesting that so far the recession slopes match Napa. 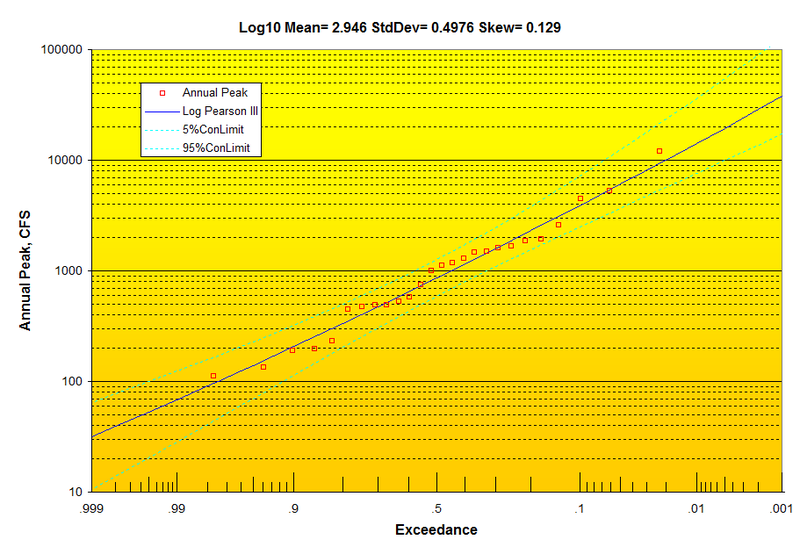 Lag times are from my free GetMapArea slope roughness stream/centroid USBR method and so far no complaints. Jun 17, 2016: Constructed dimensionless unit graph for East Fork Ashland Creek USGS gage and using at Sub2 and Sub3 for forested areas. 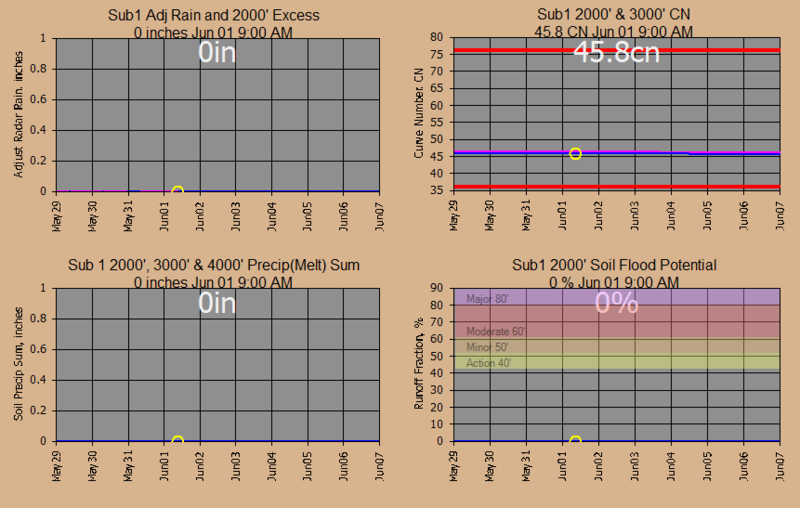 Added 1.75 inches to June 9 soil moisture Subs 2 and 3 to match USGS gage. Added 6 cfs diurnal fluctuation to Bear Creak routing above Ashland based on USGS gage flucuations to make things pretty at the gage. Jun 18, 2016: Raised percent impervious for urban areas on subs 1, 4, and 5. 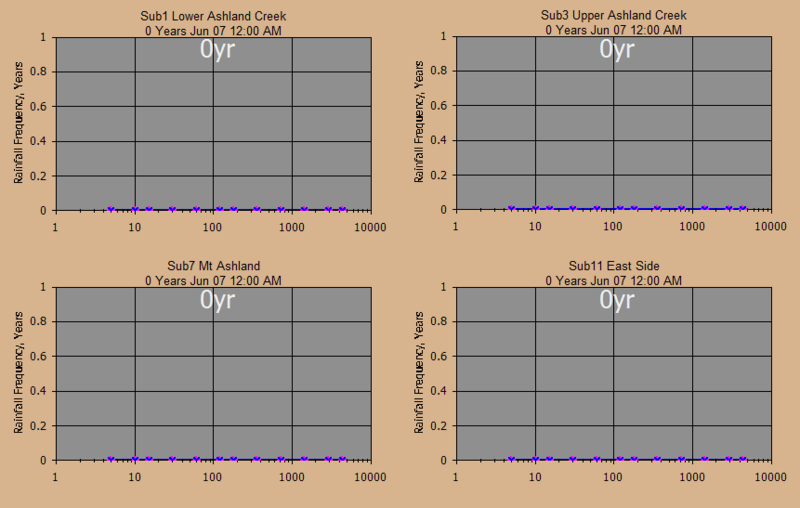 Adjusted losses in Bear Creek at Sub 12 and Ashland Creek at Mouth. Who knows where a constant 50 cfs loss goes. Jun 19, 2016: Found USBR gages on Ashland Cr at Mouth and Emigrant Creek (Sub 9). 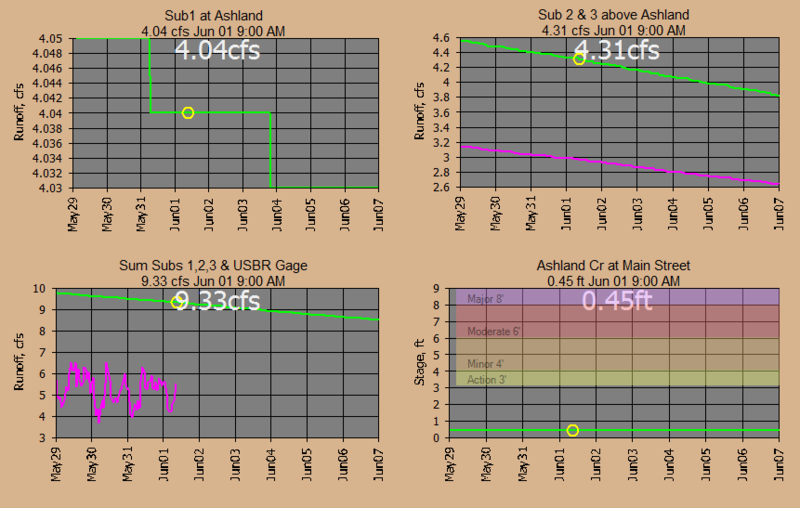 Left Ashland Cr Sub 1 alone. Raised Sub 9 percent impervious from 0 to 0.6%, raised interception factor from 0.03 to 0.07 and removed GW return with factor from 0 to 1. Added USBR Green Springs Powerplant transbasin inflow to Emigrant Dam inflows. Jun 22, 2016: Found USBR gage Westside Diversion Canal and removed from Emigrant Dam inflow. 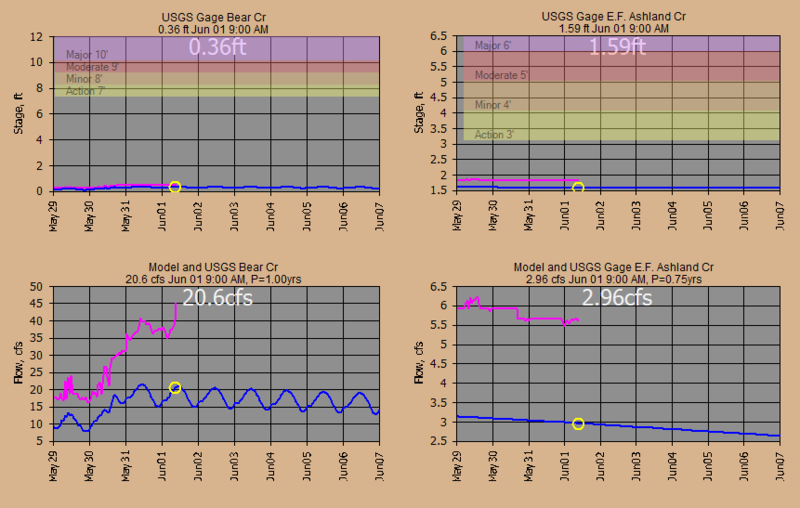 Found USBR gage Bear Creek ABOVE Ashland and added for river routing comparison at Sub 12. Found USBR Talent Canal diversion gage just above USGS Bear Creek gage and added to routing. So that's where some of the water was disappearing to. I believe the system plumbing is correct and should now be complete. 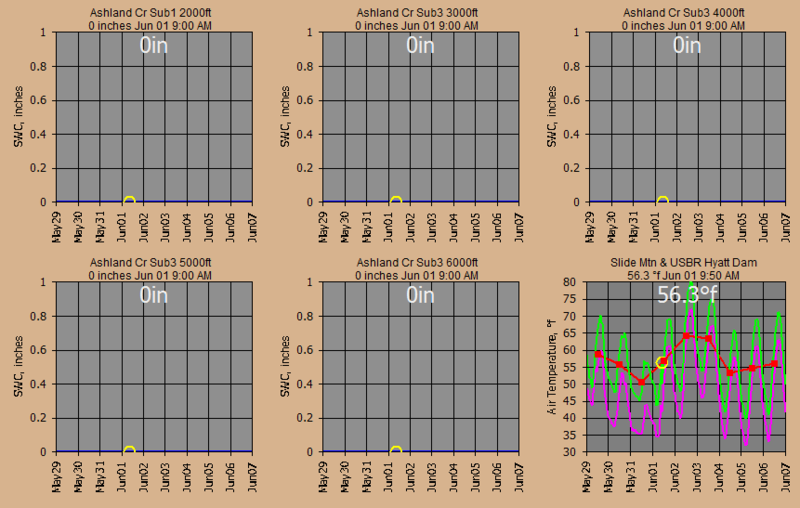 Fudge factors for diversion/runoff error are used in the routings at 3 points, Bear Cr ABOVE Ashland (-5 cfs) and Ashland Cr at Mouth (-8 cfs), and Bear Cr BELOW Ashland (+5 cfs). Emigrant Dam Storage taken from USBR Hydromet 15-minute values over 2016 six month filling period. USBR limits releases to 670 cfs river channel capacity. 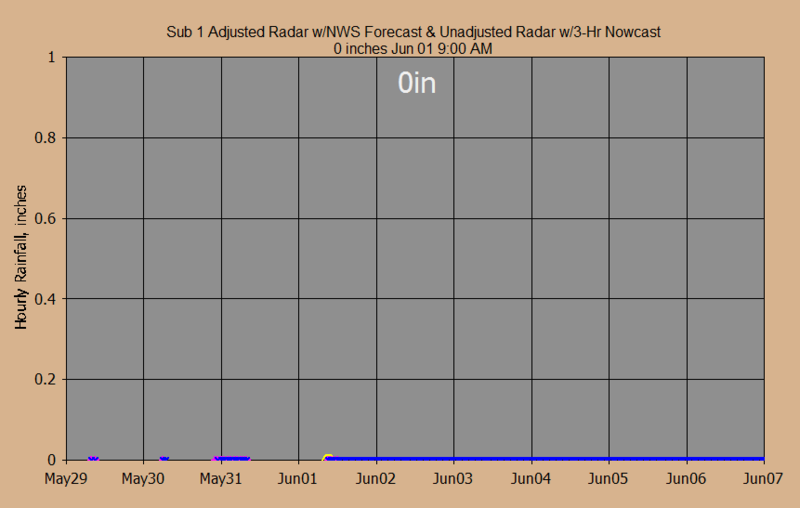 Model releases set per USBR Hydromet hour 1 each day. 1) Green Springs Powerplant inflow (Hydromet). 2) Add Sub 9 runoff. 3) Divert Westside canal (Hydromet). 4) Add Subs 8+10 runoff. 6) Emigrant Dam total release. 7) Divert Eastside Canal (Hydromet). 9) Route river release to Sub 12. 10) Route Sub 7 runoff to Sub 12. 12) Total river flow ABOVE Ashland USBR gage. 14) Divert Talent canal (Hydromet). 2) Combine Sub 1-fudge_factor at USBR Mouth gage. 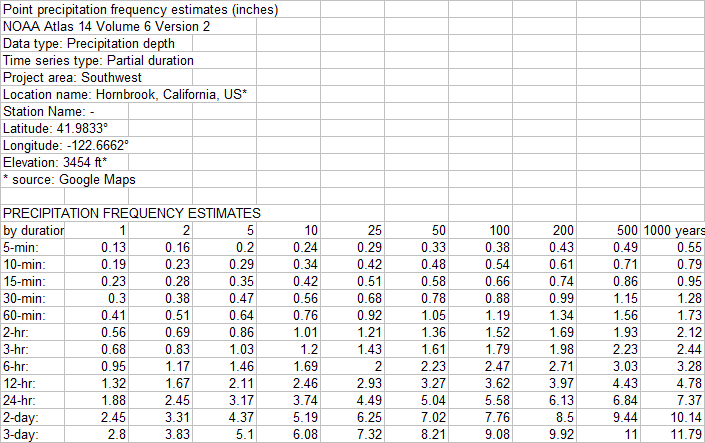 1) Combine Ashland Mouth+routed Bear Cr+fudge_factor at USGS gage for total flow. Now export 10 days of daily values from the database to Excel for each point above BEFORE routing and manually verify total.... Whooooohoooo!!!! Top 10 annual peaks are winter rains I'm guessing. It sometimes happens with a sudden warm up from a cold snow covered basin that it all can come down at once from all elevations. Toss in some rain and Kaboom!!!! "Surface temperature lapse rates over complex terrain: Lessons from the Cascade Mountains"